Southern Illinois University Edwardsville has been selected as the Region IV North site for the National Intramural and Recreational Sports Association (NIRSA) club soccer championship. The tournament will run from October 27-29, with games being held both at Ralph Korte Stadium and the Recreational Sports Complex. The top eight men’s and women’s teams from NIRSA’s Region IV universities will attempt to qualify for nationals in Phoenix. Teams from Washington University in St. Louis, Saint Louis University, Truman State University, Kansas State University and Missouri State University will be competing. 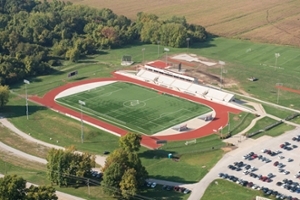 While SIUE is a member of NIRSA Region III, Cougar club soccer teams play in Region IV because of the greater proximity of teams. SIUE’s men’s and women’s club teams are ranked #2 and #4, respectively, in the East Division of the Kansas-Missouri Soccer League and are automatically qualified to participate in the tournament.